John Sutherland of Burnside Reisgil died 10th July 1903 aged 73. Wife Margaret Baxter died 7th August 1881 aged 38. 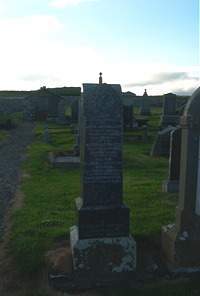 Son William Sutherland died 1892 aged 27. Son Andrew Sutherland died 1907 aged 37. Granddaughter Margaret Baxter died 1910 aged 2. I will give thee rest.